The 4th House is about your family and where you live. It's the essence of who you are, your foundation and your sense of self. 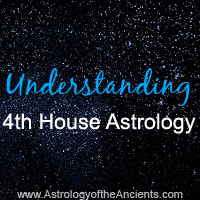 Characteristics of the 4th House: Your 4th house reveals what your childhood was like, your home life, and your family (especially your parents). It shows what life was like for you growing up, what you learned there, and any ethnic or racial qualities you might have. It can tell you what you will inherit from your family, including money. Your 4th House also reveals what your later years (senior/elderly) in life will be like, and what your retirement will be like. Your 4th House gives meaning to who you are at your core. It's the very roots of your being. You can think of it as your soul if you like, but much of who you are was shaped from how you perceived your experiences as a child. These experiences are ruled by your fourth house. Who are you at your deepest, innermost point? What do you want your home life to be like? What qualities in your family and home do you connect most closely to? What is your innermost motivation? What if you had Venus in your 4th House? What would that tell us about you? You probably had a very loving, affectionate family. You view your childhood and home life as being filled with warmth and kindness. You likely appreciate your family traditions. You resolve issues without a lot of mess and drama, keeping things nice and clean.